So, you are ready to purchase one of the Nescafe Dolce Gusto Coffee brewing systems. In some way, you’ve made an excellent choice, because Dolce Gusto coffee machines are both functional and economic. Their ergonomic exterior, wide range of the beverages and quite a low price made to consider them as the most desirable kitchen appliance. In our post, we will not observe Dolce Gusto or other single-serve coffee machines but will discuss different capsule types and beverages you can brew with their help. Let’s get started. Every Dolce Gusto capsule box consists of 16 pods. If it’s black coffee then you can make 16 cups of perfect coffee, and if your purchase a box of lattes beverages, it’ll be only 8 cups of the beverage. 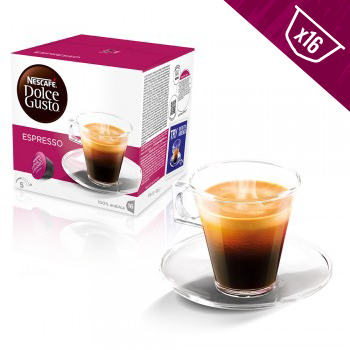 Milk coffee boxes consist of 8 capsules with coffee itself and of 8 capsules with milk powder to make a froth.These capsules are compatible with different Dolce Gusto Coffee Machines, such as: Nescafe Dolce Gusto Mini Me. 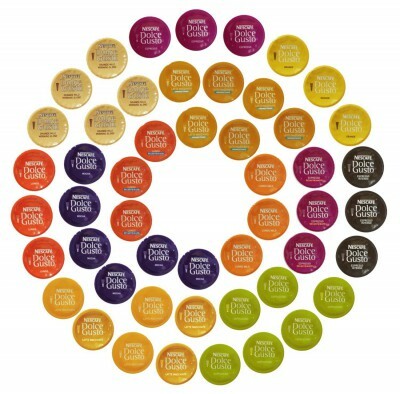 Today Dolce Gusto coffee pods line includes more than 20 varieties of black coffees, espresso, lattes, cappuccinos, chocolate drinks, teas, and so on. First of all, we’ll watch over the black coffee Dolce Gusto beverages. And this post will be the first of the several articles about black coffee Dolce Gusto capsules. Espresso is 100% pure Arabica carefully roasted and ground. Under the pressure of 15 bars, each espresso pod gives 180 ml of perfect coffee with foamy velvety cream at the top. Dolce Gusto espresso pod has an intensity for about 5 of 11. So, a cup of this coffee may become a perfect beginning of your morning. Intenso is Robusta and Arabica coffee beans middle-dark roasted and ground. One pod gives 180 ml of intense, strong espresso with the same traditional for each espresso beverage velvety foam. Espresso Intenso is very useful not only in the morning while you are beginning your day. It also will help you to stay awake during the day. One cup of the drink has intensity for about 7 of 11. It is really strong. Dark Roast is one of the strongest coffee beverages in all Dolce Gusto series. It has intensity for about 9 of 11. Each capsule consists of perfectly grounded dark roasted Arabica beans. You can recognize this beverage by the sweet chocolate notes with the far licorice taste. 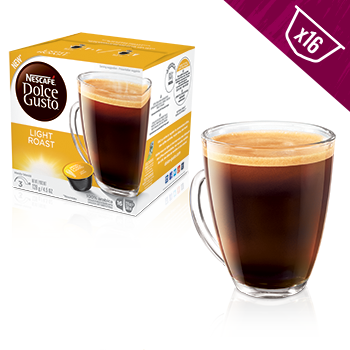 One Dolce Gusto Dark Roast pod produces 360 ml of perfect black coffee. So, if you want to start your day full of energy or meet every obstacle with your head up ― Dark Roast will help you in your beginnings. 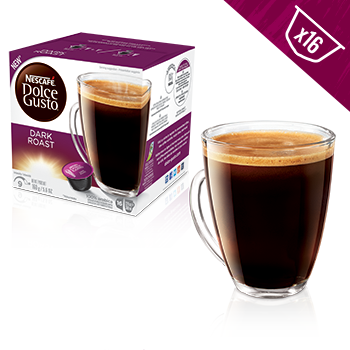 Light Roast Dolce Gusto coffee has a unique tender taste. It hardly will wake you up in the morning, because it has rather small intensity (3 of 11), but it can make you enjoy every moment you drink it and even long time after. Light with smooth fruity flavor this beverage is made of perfect Colombia and Brazil Arabica coffee beans. To get the typical for this drink taste, every bean was carefully and lightly roasted and perfectly grounded. So, one pod of the Light Roast gives 360 ml of coffee. Dolce Gusto Medium Roast is a perfect blend of pure 100% Arabica taken from different parts of the world. Every pod consists of carefully roasted and ground beans from Columbia, Brazil, and Ethiopia. Medium roast single-serve pods have very special taste and flavor. They are warm richly filled with jasmine notes. The main string of taste is of toasty-spicy ― very-very special. But, surely you’ll like it. Each pod of the Dolce Gusto Medium Roast coffee can produce 360 ml of the pure coffee. One cup of the beverage has intensity of 5/11 ― medium. It’s rather good when you start your day. But this drink is so special taste that you’ll enjoy it even during the day. Other dark coffee Dolce Gusto pods you will find in the next post (the link will appear as soon as the article is ready to be published). We only want to remind you that capsules we’ve described in this post are compatible with Nescafe Dolce Gusto single-serve coffee machines (more information of the single-serve technology you can find in this post).